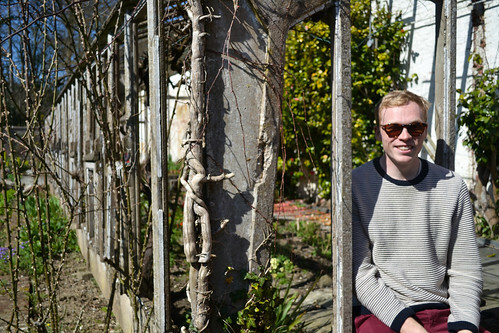 Food blogging goes in yearly cycles. 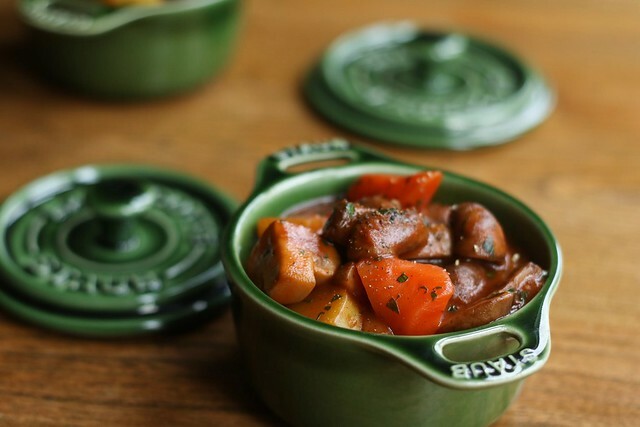 Between the months of November and February it’s obligatory, at some point, to devise a new one-pot stew recipe and state just how much we love the autumn and/or winter. Here we are again. 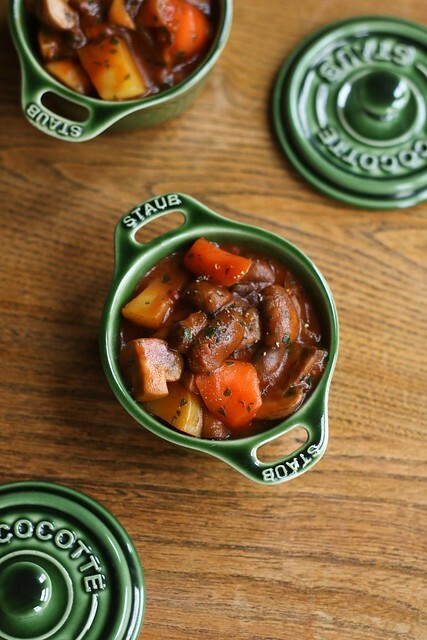 Usually, a winter stew would mean plenty of beautifully aged meat, slow cooked to an almost butter-like consistency. Cooking with mushrooms is different. Even over many hours of cooking they retain their distinctive consistency – so why bother? This one-pot mushroom stew is a quicker, cheaper alternative to its beefy brethren, but it doesn’t lack in the flavour department either. Good quality mushrooms, helped along by big flavours in the bay leaves, stock and Worcestershire sauce make for a tasty stew to rival any. Talking about stock. 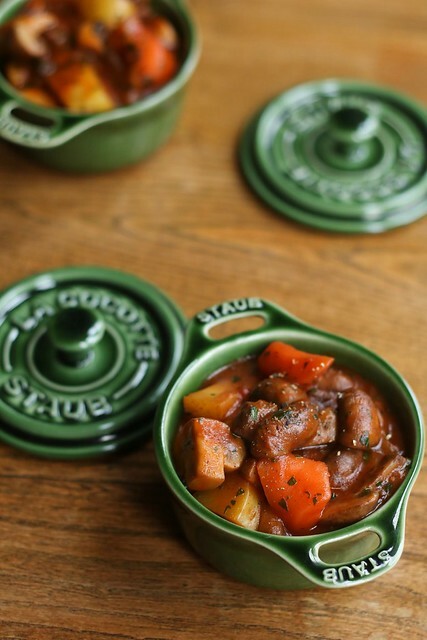 Despite the vegetarian nature of mushrooms, I personally enjoy making this stew with good-quality beef stock. It adds a depth of flavour to the dish. However, if you’d prefer to make a vegetarian stew, seek out a top-notch mushroom stock. It’ll complement your funghi nicely. In an effort to keep the cost of this mushroom stew relatively low it uses chestnut mushrooms, which offer incredible bang for buck. Having said that, you can often find shiitake, portobello and oyster mushrooms on offer. If that’s the case, please go ahead – it’ll give the dish an extra dimension of flavour and variety of consistency. Saute the onions in the olive oil for 5 minutes or so, before adding all of the mushrooms and garlic. Cook until the mushrooms begin to release their water and shrink. Tip in the carrots and potatoes, before adding the stock, tomatoes, puree, bay leaves, Worcestershire sauce, salt and pepper to the mix. Simmer for 20-30 minutes, until the vegetables are cooked through. Beat the flour with a little water and stir through the stew to thicken. Simmer once more for 5 minutes. Chop and add the parsley, and serve immediately with a fresh sourdough loaf. Cost: Cost here is entirely dependent on the mushrooms you can get your hands on. Using chestnut mushrooms, as suggested, should mean you can whip this up for no more than about £3. Go more exotic, and that figure could rise to maybe £5-6, which is still well under £2 per portion. Sounds really good and thanks for mentioning the need to change the kind of stock if making as a vegetarian but Worcestershire sauce is a problem for veggies – it’s made with anchovies! Elegant looking dish Nick. 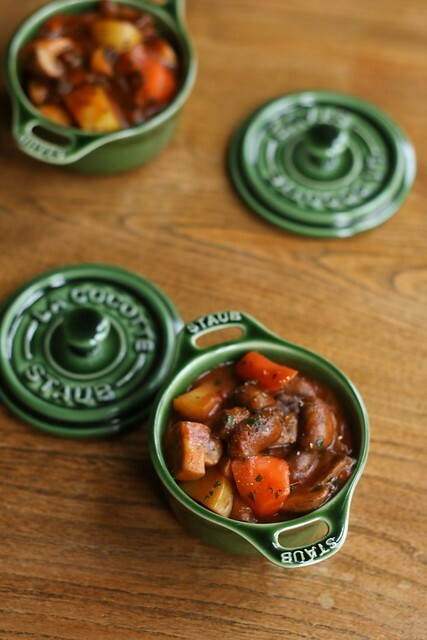 Those Staub pots are excellent. I hope you are keeping the cycling up through the winter. I have been off the bike for 5 weeks now and plan to get back into it this week. Winter miles, summer smiles and all that. Now I know what to do with those mushrooms in the fridge. Hey Nick, I also read your post and I really enjoyed your recipe, I love your pictures as well, this one pot mushroom looks sooo good & delicious, I will try to making this in some few days later. Thanks for sharing……….! This dish is amazingly Delicious! I served it over mashed potatoes. Makes me thankful to be Vegan! One of my friend requested me to prepare a mushroom dish for our house party and I was looking for a good mushroom recipe. Your post was really helpful. Thanks Nick for your detailed post.